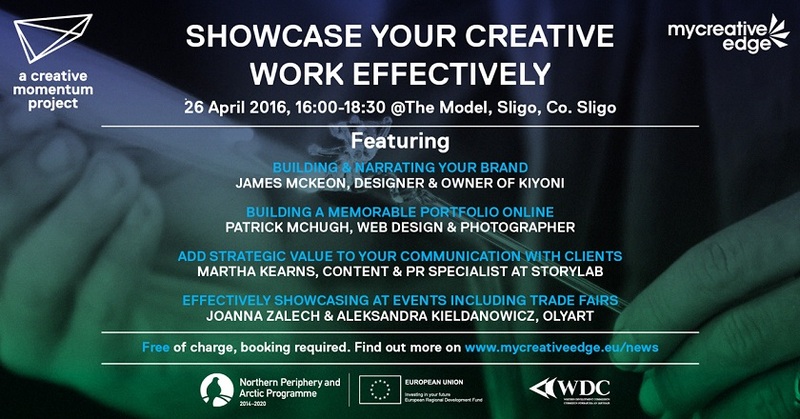 Showcase your Creative Work Effectively is a free information and networking event that will be held at The Model in Sligo from 16.00-18.30 on Tuesday, 26 April and will be followed by refreshments. It is organised by the Western Development Commission (WDC) under ‘a creative momentum project’, which operates the www.MyCreativeEdge.eu showcase website for creative enterprises in the regions. The event will focus on how creative enterprises can attract make an impression on clients as well as the media, both online and in person. The line-up of speakers have huge experience in making creative work stand out from the crowd. Martha Kearns is Managing Director of StoryLab, a Sligo-based content and PR company with local, national and international clients. Martha is a highly-respected journalist and communications professional with over 15 years media experience. After 15 years working in the fashion and advertising industry in New York and London, Clare-based photographer Patrick McHugh now helps his fashion, accessories, craft and jewellery clients to create a memorable online visual presence. From Galway, James McKeon is the founder and designer at Kiyoni – a luxury brand of designed a luxurious range of colourful silk scarves, his collections are now stocked in London and Abu Dhabi. He will outline how the company has created a strong brand and will be joined by Lisa McKeon, who is the company’s director and Social Media Manager. Finally, Aleksandra Kieldanowicz and Joanna Zalech,who run OLYART, will discuss showcasing at Trade Fairs. OLYART is located in Galway and specialises in souvenir gifts from Ireland, which are sold nationally and internationally.